XL Displays are proud to announce that we now supply LED exhibition lights with all pop up exhibition stand bundles as standard at no extra cost. Pop up exhibition stand LED lights enhance exhibition stands and maximise brand awareness, bringing many benefits to your business as a result. Previously, it would have cost you £80.00 to upgrade your exhibition lighting. We strive to help you get the most out of your investment whilst keeping costs as low as possible, which is why we have opted to provide our customers with a free LED lighting upgrade with all pop up exhibition stands - including linked pop up display stands. By including LED lights for free, we can help you save up to 60% off your exhibition lighting costs and increase the appeal of your business at the same time. Capturing the attention of visitors at event shows is a hard task, but if you fail to engage your audience, your time and money will have been wasted. There are many ways to grab people’s attention, but one of the simplest ways is the use of lighting. By illuminating your exhibition stand, you are creating a luminous display that visitors will be drawn to. XL Displays’ pop up LED lights give you all the benefits of high-quality exhibition lighting – for free. 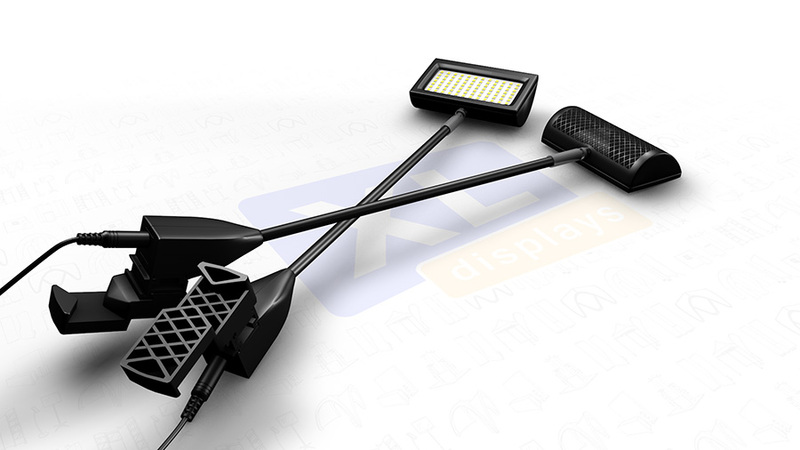 Why Choose XL Displays Exhibition Lights? Our lights use the latest LED die technology and utilise a 12w low power consumption – the equivalent of 80w halogen per LED light. 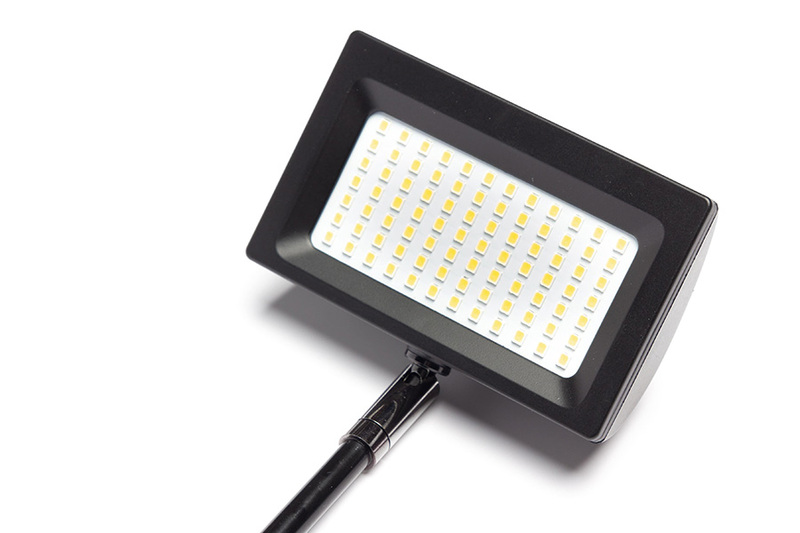 This means they are more eco-efficient than halogen lights which are most commonly supplied with pop up stands. The 1200 lumen output ensures a bright light output, whilst the 5600k colour temperature provides a soft daylight white glow. This means that unlike traditional LED lights, ours do not emit a harsh blue glow; instead it is more inviting and natural. Our LED lights come with a CRI (colour rendering index) of 85+, meaning they won’t distort your display graphics because they accurately highlight the true colours of your stand. You can spend hundreds of pounds and lots of time on getting the graphic design of your exhibition perfect, but if your exhibition lights have a low CRI, your design can look cheap and ugly. CRI is scored out of 100. The higher the number, the better the lights are and the better your display will look. We are proud that our LED lights rank so high, allowing you to show the true potential of your display and your business. In addition, each light comes with an internal heatsink to ensure heat dissipation, resulting in a higher standard of safety. The lights are cool to touch after use, allowing you to pack up your exhibition stand quickly and efficiently, without the need to wait for the lights to cool down. The head of the lights can be easily adjusted by either rotating, swivelling or tilting the light to the perfect position to complement your exhibition stand. We know that electric sockets are an expensive resource at exhibition events, which is why we have manufactured our pop up LED lights to have two lights per driver, per socket. This means you need fewer sockets compared to other light solutions, saving you more money. In addition, the wattage required by each light is lower, so you can minimise the cost of electrical outlets at your exhibition even further. Pop up LED lights add a welcoming glow to your display stand and highlight key aspects of your exhibition. This makes them perfect for use at events such as product launches, trade shows and more. Pop up LED lights come in a single box for added protection and convenience during transportation and delivery. 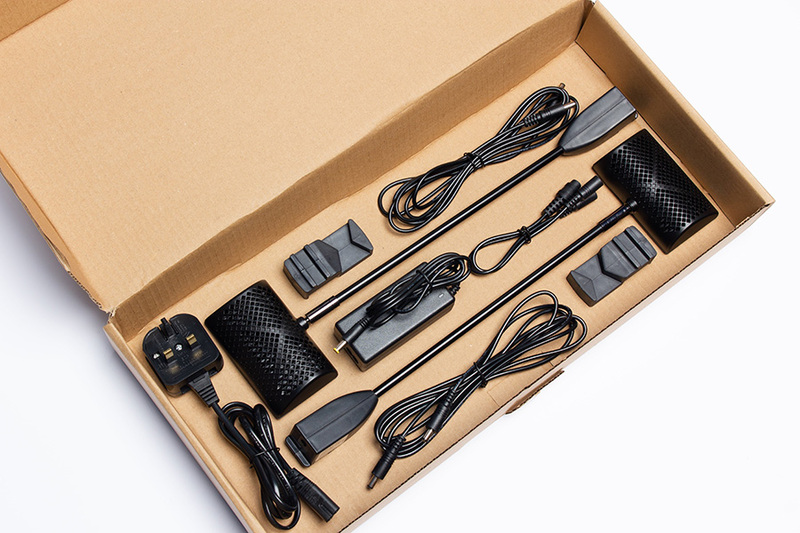 Within the box, you get everything you’ll need to set up your lights. There are two lights, two brackets, one driver and one plug socket per kit. The choice of bracket gives you the option to attach your lights wherever you like on your display, offering you more flexibility to create the perfect exhibition stand to promote your business. LED lights are effortless to attach; simply slide the bracket onto the end of the light and slot the light onto the scissor part of the pop up stand. The easy assembly requires no tools and can be completed within minutes. Click here to view our full range of pop up exhibition stands with LED exhibition lighting. For more information on our pop up exhibition stands or any of our other products, contact us or call us on 01733 511030.